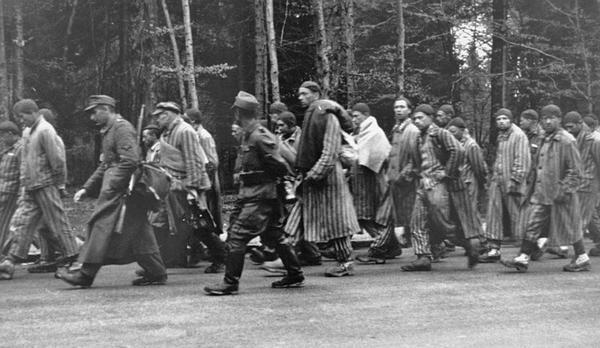 Nazi guards force Jewish prisoners on a death march during World War II. The fifth man from the right is Leo Wolf, who survived the Holocaust and co-founded the Holocaust Museum & Learning Center with Tom Green and Bill Kahn. Paula Bromberg was a Polish Jew whose family was seized by the Nazis, forced to live in the Lodz ghetto and later sent to the death camp at Auschwitz-Birkenau. She was sent from there to another camp, where she was exploited as slave labor. On May 6, 1945, her camp was liberated by the U.S. army near the end of World War II. She was the only one in her family who survived to see freedom. Bromberg met her future husband, Harry, in a displaced persons camp after the war. They and their young child resettled in St. Louis. Decades later, she told her story to Vida "Sister" Goldman Prince, with a tape recorder rolling. Bromberg died in 2013. After years in storage, the interview on that tape — and those of 143 other Holocaust survivors with ties to the area — is now online. St. Louis Public Radio's Jeremy D. Goodwin on an archive of oral histories given by Holocaust survivors that is now available to the public online. The online archive of oral histories, complemented with photographs and timelines depicting each survivor’s journey on a map, was put together by the Holocaust Museum & Learning Center. Prince spearheaded the oral history project, leading a team of volunteers and recording survivors’ stories over the course of decades. She has retired from interviewing survivors but still lives in the St. Louis area and financed the transfer of the digitized interviews to the online archive. Like those of many others, Bromberg’s story is filled not just with tragedy but with resilience, hope and the deeply mixed feelings that survivors of mass trauma can experience. Conversations about the Holocaust often begin with a statistic that’s hard to fully comprehend: In a state-sponsored campaign of terror, German Nazis and their collaborators murdered six million Jews and millions more from other groups, including gays and the mentally and physically disabled. In addition to memorializing this history in perpetuity, the online archive is designed to break down the Holocaust from a monolithic, unfathomable exercise in evil to something more comprehensible: a collection of firsthand accounts. “You’re hearing about a personal experience. You can hear this person, what they went through, and it really gives it a certain quality that just boils it down to one person’s story,” said Jean Cavender, director of Holocaust Museum & Learning Center. When Oskar Jakob told his story for museum volunteers, he filled up seven cassette tapes. At 14, he was sent to Birkenau, the Nazi death camp in Poland, where he was separated from most of his family. In January of 1945, he was forced on a death march for three days and nights through the bitter cold, with no food or water. Those who survived that ordeal were packed into cattle cars and sent to another camp. Many died along the way. Jakob and the others who remained were given a grisly task. Jakob, his father and cousin were able to survive the camps; his mother, brother, sister and another cousin died at Auschwitz. Oskar Jakob and his cousin opened a Jewish delicatessen in Frankfurt before securing permission to emigrate to the U.S. He settled in St. Louis with his wife Margo, and they raised two children here. The permanent exhibitions at the Holocaust Museum & Learning Center are also designed to personalize the horrors of the Holocaust for future generations. As she gave a recent tour, employee Lory Cooper gestured to a photograph of a death march, with Nazi soldier forcing a group of Jewish men along a road. She pointed out one prisoner in the photo: Leo Wolf, who went on to co-found the museum with Tom Green and Bill Kahn. He was friends with her late grandparents, who also survived the Holocaust. MORE: Follow the journeys of survivors on the Holocaust Museum and Learning Center's interactive timeline maps. Jeremy can be found on Twitter @jeremydgoodwin. Clarification: This post was updated to make clear that Birkenau was located in Poland and established by Nazis.